1-Way Voice (Listen-In) is a safety feature that helps you locate your lost child, especially when indoors and there is no GPS reception. It can help provide guidance to caregivers and it can be used to monitor your child's care. 2-Way Voice (AngelCall) allows you to talk to your child without them having to "pick up" or click anything. 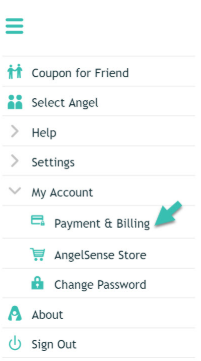 The AngelSense monthly service subscription includes 60 free minutes for 1-Way and 2-Way Voice combined for a calendar month (renews on the 1st of each month). Once you exceed the 60 minutes, you will have a negative balance on your minutes. If you purchase more minutes, these minutes will be subtracted. Any unused free minutes do not rollover to the next calendar month. The app will alert to a low balance of minutes. Additional minutes can be purchased from our AngelSense Store page. The free minutes are always the first to be used and then any purchased minutes are used after the free minutes are depleted. Any minutes that you purchase never expire. Primary Guardians can see your minutes used within your app using the "My Account" section and purchase minutes. You can also see each call, who the call is from, the time the call came in, and the duration of the call as well in this area. 1. Go to the menu on the left hand side and click on "My Account" and "Payment & Billing"
2. Scroll down to "Voice Balance" and you can see how many minutes you have remaining. You can click "Buy Minutes" if you would like to purchase more. Can other people call my child's device?